When you think of super sonic flight, you probably first think of the Concorde. But that wasn't the first super sonic transporter and it certainly wasn't the first commercial plane break the sound barrier. Those honors belong to the Tupolev TU-144, the USSR's only super sonic transport. 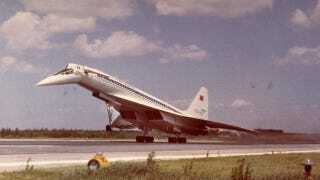 The Tupolev is one of two super sonic transports (SST) ever built for commercial use—the other being the Concorde. Design began on the soviet jet in 1962 and the first prototype flew on New Year's Eve of 1968 outside Moscow, two months before Concorde got off the ground. While the Tupolev did closely resemble the Concorde (amid speculation that Soviet espionage was behind the resemblance) the two planes did differ in many technical aspects. The Concorde had better range, braking and engine control but the Tupolev had vastly superior aerodynamics. The Tupolev's wings also included two small retractable canard surfaces—for generating low-speed lift—that the Concorde lacked. It was also generally perceived as less stable in flight, especially at supersonic speeds, than its counterpart. That instability was made evident in 1973, when its very first production model crashed at the Paris Air show, killing all six crewmen and another eight people on the ground. The cause of the crash remains undetermined, with the French and Russian governments still blaming each other for the plane's failure. The Russians think a mysterious French Mirage fighter jet that appeared to be tailing the TU-144 just before it went down caused the crash. The French have accused the Soviet flight crew of trying to bank the plane too hard.